You'll earn a Facewest Credit of £26.96 with this item. 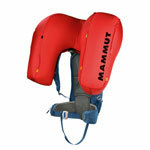 The Mammut Pro Removable 45L is one of the largest volume airbags that we sell. If you need more kit than this bag will take then you can't have an airbag. This bag is for extended touring missions or those touring into locations with other goals. The Pro Removable 45L is very well specced and featured for whatever style of alpinism you are doing. Full list of features below. The Pro Removable uses the 'wings' style 3.0 airbag that is completely removable for when there is no avalanche risk. 1. Robust. It has survived 'bush bashing' through dense and destructive kiwi bush, the zips have all held up, the buckles are all strong and can't get crushed and it protects the airbag well. I have carried it with huge weights, gear, skis and boots hanging off to approach distant mountains and it has not failed on me. 2. Access to equipment. Even with the airbag in the zip allowing you to remove the backplate allows really fast access to your equipment. A separate pouch that holds the other Avo safety gear at immediate notice is also excellent and stops the probe or shovel getting 'lost' somewhere amongst your other kit. 3. Size and Fit. I've found it comfortable from the off. I often get hip rub or similar with other bags but this is comfortable. I'm able to fit enough equipment to do multi-day hut to hut trips (sleeping bag) or an overnight bivvy (including sleeping mat). 1. Goggle pocket. Too small and only partially lined - unfortunately on the side that you wouldn't normally have your lens against! 2. Airbag zip can pull open. Although this is NOT a safety issue, it can be annoying sometimes when your pack is really full it will pull apart the zip which the airbag deploys out of. This is easily rectified. Replacement test tool for Mammut airbags. Day airbag for snowboarding, split boarding and skiing. 1.91kg.